It might sound far-fetched, but it's a reality for many people. Corneal Refractive Therapy (CRT) is a non-surgical process clinically developed to reshape the cornea while you sleep. The result is the temporary correction of myopia with or without moderate astigmatism. 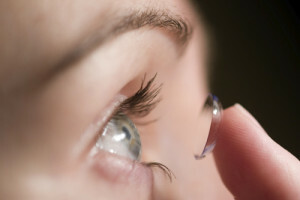 CRT has been performed for decades by eye doctors who specialize in contact lens fitting. Recent interest in CRT has increased due to advances in technology and a desire among many people for a non-surgical alternative to LASIK and other refractive eye surgery to correct their nearsightedness. Similar in appearance to a standard contact lens, CRT lenses gently reshape the corneal surface during sleep to provide clear, natural vision when the lenses are removed upon waking up in the morning. CRT offers freedom from glasses and the hassle of wearing contact lenses during the day. This revolutionary technology can enhance the lifestyle of those requiring vision correction but do not want to wear glass or contacts during the day. Active individuals can freely participate in sports without the interference of glasses or contacts.